You may be traveling at Mach 1.6, but inside Aerion's supersonic business jet (SBJ), life slows down a bit. A cabin length of 30 feet allows for three seating areas, a full galley and a comfortable lavatory. Its height, 6.2 feet, and width, 6.5 feet, make it comparable to other midsize jets. Arrangements for up to 12 passengers are possible. High-speed travel is yours without sacrificing high-end amenities. At supersonic speeds, you won't spend many hours here. But they could still be among your most enjoyable. The JT8D also meets the latest ICAO standards for nitrogen oxide emissions and noise regulations and will cruise at a maximum altitude of 51,000 feet, placing it in the lowest part of the stratosphere and avoiding cruise in the fragile ozone layer. *Based on Pratt & Whitney analyses assuming 60 percent supersonic flight time. No exotic structural materials or manufacturing techniques are required. The Aerion NLF wing will be constructed of carbon epoxy with a coated metal leading edge for erosion resistance. The fuselage, empennage and nacelles will be a combination of aluminum and composite materials. And the supersonic business jet (SBJ) will leverage fly-by-wire flight control, which provides greater flexibility in systems routing, failure redundancy and service access, as well as reducing maintenance and weight. While Aerion's NLF wing design is the core technological revolution of the SBJ, we have also obtained patents for fuselage contours, inlets, engine expansion nozzles and other aerodynamic features. We realize that the world is moving faster. Much faster. And we know that time is your greatest investment. Whether your flight is completed at subsonic speeds, maximum supersonic cruise or some combination thereof, range is constant and destinations are closer. Our faster future translates to your faster connections. From New York, Aerion reaches all of Europe and Brazil. Asia is just one stop away. New York to Miami. Aerion: 1:30. Subsonic: 2:30. New York to Los Angeles. Aerion: 4:15. Subsonic: 5:00. New York to Paris. Aerion: 4:15. Subsonic: 7:15. New York to Asia. Aerion: 9:30. Subsonic: 14:30. From Dubai, Aerion reaches all of Europe and most of Asia nonstop. One stop away? The United States. Dubai to Singapore. Aerion: 4:15. Subsonic: 8:00. Dubai to Tokyo. Aerion: 7:45. Subsonic: 9:45. Dubai to London. Aerion: 5:00. Subsonic: 6:45. Dubai to New York. Aerion: 9:30. Subsonic: 14:30. Consistent with our competitive commitment, Aerion's operating costs will be equivalent to many of today's large business jets, thus at last and forever overcoming supersonic flight's greatest obstacle. Spike Aerospace is not the only company committing itself to offering supersonic flights, however. The Nevada-based company Aerion Corporation has submitted plans for the development of a private jet that could reach speeds of Mach 1.6, potentially carrying its first passengers by the end of the decade. HyperMach Aerospace Ltd, meanwhile, has proposed the development of SonicStar, a jet the company claims would reach Mach 4 (about 2,600mph and approximately twice the speed of Concorde) and could speed from London to Sydney in an afternoon or from New York to London in about an hour. The firm estimates it could enter production in the 2020s. 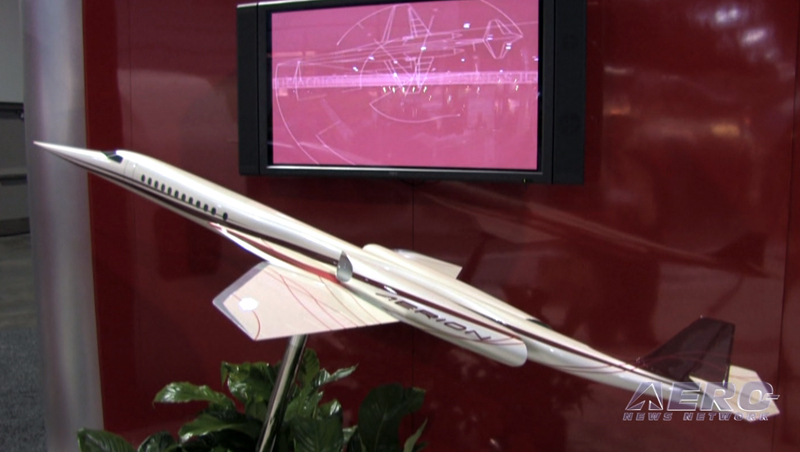 Now that the Aerion AS2 SSBJ is a trijet, maby they should team up with Dassault. Aerion is seeking an engine supplier now that it has switched to a trijet configuration for the “AS2” supersonic bizjet. Despite the configuration changes, which are being formally announced here at EBACE this week, Aerion anticipates that its supersonic business jet will still be certified in 2021. First flight is expected in late 2018 or early 2019, followed by a 24-month certification program. Inside, the aircraft’s larger cabin has a cross-section dimension nearly identical to that of the Gulfstream G550, sharing the same 6-foot 2-inch height although the AS2’s width is just one inch narrower, at 7 feet 3 inches. The 30-foot-long cabin, which is 17 feet shorter than the G550’s, will feature a two-lounge layout, galley and both forward and aft lavatories, plus a baggage compartment that is accessible in flight. Outside, the AS2’s fuselage is 160 feet long, some 25 feet longer than the originally conceived SSBJ, and it has a wingspan of 70 feet. Maximum takeoff weight is 115,000 pounds, up from the original aircraft’s 90,000 pounds. While the minimum projected range is 4,750 nm, Aerion is aiming for 5,300 nm. This is up from the original SSBJ’s projected 4,000-nm range. According to Aerion, the AS2’s balanced field length is 7,500 feet at mtow. However, this can be lowered to 6,000 feet at takeoff weights below 100,000 pounds to allow for operations at airports with shorter runways or weight restrictions while retaining a transatlantic range of 4,000 nm. This would permit the AS2 to operate from Teterboro Airport, which has a 100,000-pound mtow restriction, as well as other major business aviation hubs with 5,000- to 6,000-foot runways. 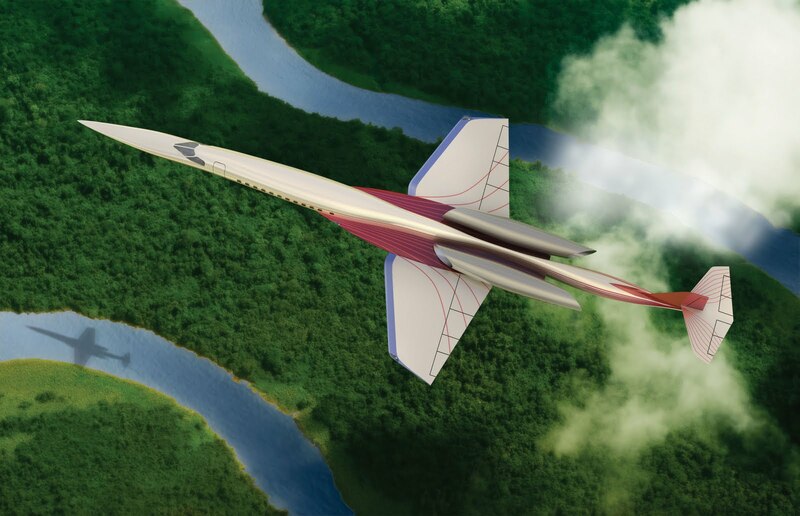 As with the smaller, original Aerion SBJ, the AS2 will have two cruise “sweet spots,” where range and efficiency are at a maximum–one at about Mach 0.95, for efficient cruise where supersonic flight is prohibited; and one at about Mach 1.4. At both speeds, total operating cost will be comparable to current ultra-long-range business jet offerings, Aerion said. The AS2’s maximum speed is Mach 1.6, the same as its predecessor. Its trijet configuration yields better runway performance and a lower noise profile, which is “especially important with Stage 5 noise requirements looming,” Nichols told AIN. The company is currently in discussions with “leading engine suppliers” to find the optimum core engine for adaptation to supersonic requirements. The selected engine core will be in the 15,000-pound-thrust range–a list that includes the Pratt & Whitney Canada PW800, GE Passport and Rolls-Royce BR710. Aerion plans to announce the winning engine at the NBAA Convention in October. While discussions with potential OEM partners continues, Aerion is going forward with the advanced design of the AS2, with detailed design slated to be completed in the middle of next year. It is also continuing testing and recently concluded a series of low-speed wind-tunnel tests at the University of Washington Aeronautical Laboratory that assessed various high-lift flap configurations. Aerion will also do further wind-tunnel tests on other configurations over month or so. According to Nichols, Aerion plans to conduct another round of natural laminar-flow wing robustness testing on NASA’s F-15B testbed this summer or fall, depending on aircraft availability. To date, Aerion has invested more than $100 million to develop proprietary enabling technologies and optimization design tools to enable development of an SSBJ, it said. Great find my dear Rolf. Very nice. I hope this one actually gets built. I'm kinda wondering why noise requirements would make it a three-nacelle ship instead of two like the last one. Probably so they can run each engine at lower power during take-off. 3 engines at 70% is most likely quieter than 2 at 100%. Is that true ? Airbus joins the development phase ?? "Aerion, Airbus Group to work together on supersonic jet technology"
Airbus Group and Aerion, which is developing a multi-million supersonic business jet, will collaborate on the jet’s development and exchange knowledge and capabilities on design and certification. For Aerion, it’s a major step forward in the advancement of the development and commercialization of its Aerion AS2 supersonic business jet. Aerion officials knew it would take a well-established original equipment manufacturer to complete the project, he said. Under the agreement, Airbus Group, through its Defence and Space division, will provide technical and certification support. That will include the assignment of senior engineering staff to Aerion’s organization. The two groups will work together at Aerion’s facilities in Reno, Nev.
“It puts us solidly on track toward our objective of certifying the world’s first supersonic jet in 2021,” Robert Bass, Aerion’s chairman and principal investor, said in a statement. It’s too soon to say whether Airbus will be involved in manufacturing the plane, Barents said. “We still haven’t determined that,” he said. It’s also too soon to say whether Airbus’ design and engineering site in Wichita will be involved in the project, Barents said. Airbus did a thorough job of analyzing Aerion’s design tools that it’s developed over the past several years., Barents said. Over the longer term, Aerion will provide proprietary technology and assistance to Airbus Group in its high-performance technology development, which include Aerion’s research, proprietary design tools and patented aerodynamic designs, the company said. “They have exclusive rights to utilize those design tools as they look at developing their product line,” Barents said. The plan is to certify the plane in 2021 with first delivery in 2022. Flight testing would begin in roughly 2019. The plane will sell for roughly $110 million. The cost depends upon which engines will be selected for the plane. Aerion is doing an analysis with three large engine manufacturers. In May, Aerion announced that it had revamped the design of its supersonic jet to a larger-cabin, three-engine model that can fly farther. The redesign was made to meet changes in the market, officials say. A recent market study that assessed customer demand – especially in emerging markets such as Asia – found preferences for a corporate jet that can fly fast enough to break the sound barrier, while providing ample room and greater range. Aerion significantly widened the cabin’s cross section and increased its range from 4,700 nautical miles to more than 5,000 nautical miles. In the revamped design, the jet will have two “sweet spots” where range and efficiency are at a maximum, Aerion has said. One is at about Mach 0.95, or 723 mph, in places where supersonic flight is prohibited. The other is at a supersonic speed of Mach 1.4, or 1,066 mph. The plane is expected to have a maximum speed of Mach 1.6, or 1,218 mph. The latest study also confirmed demand for more than 600 units over 20 years.